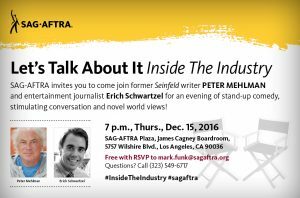 The event is centered on the incredibly talented and hilarious Peter Mehlman, who was the head writer on Seinfeld for nine years. Recently, Peter has branched into standup comedy and he will be entertaining our audience before sitting down with Erich Schwartzel of the Wall Street Journal for a fun and stimulating conversation where nothing is off the table! Afterward, we will be serving dessert and coffee while our guests, many industry professionals among them, will be able to network and get a chance to pick Peter’s wonderful brain.